Judge "Monty" Morson was also well known for the speed with which he tried cases: he was alleged to have been particularly anxious to get through cases during the horse racing season. Morson expected lawyers who appeared before him to perform their courtroom duties quickly. 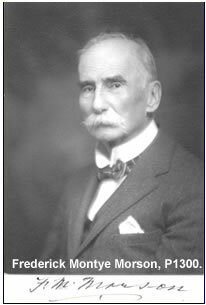 Former Chief Librarian George Johnston swore that the rumour was true that when he thought that counsel took too long to examine or cross-examine witnesses, Judge Morson would throw his handkerchief in the air and catch it in his mouth. His reputation for speed was accompanied by a reputation for fairness, vast legal knowledge and skill in the use of his cuspidor. Anecdotes about Judge Morson's eccentric behaviour were legend. For example, a bookkeeper sued the wagon driver whose load of lumber had hit him and knocked him off his bicycle in front of Osgoode Hall, damaging his trousers. The bookkeeper sued for the cost of buying a new suit, arguing that he had to be well dressed and he could not be seen in patched clothing. "Patched clothes," Judge Morson allegedly cried, "I'm sitting upon a pair of patched trousers right now and I don't care who knows it", and cut the claim from $15 to $5. Despite or perhaps because of his eccentricities, Morson was respected and loved by lawyers and colleagues on the bench. Clients, habitués, officials and members of the court staff appeared to celebrate his last day on the bench in June 1931, "probably the largest crowd ever assembled in division court," according to a local newspaper. A prominent member of the Toronto Bar paid high tribute: "You are the man, sir, who trained the Oslers, the Tilleys, the Blackstocks, the McRuers, the Slaghts and all the other lights of the bar." 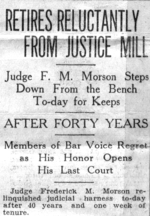 Judge Morson appreciated deeply the remarks and declared his last court appearance "a regrettable morning for me, sad because I have to give up my loved work and association here with you members of the bar." Morson died on March 15, 1944, at the age of 92. When he died, the Globe mourned the loss of a widely-respected and beloved jurist. He was also remembered as a link with a bygone past: his appointment to the bench was the last judicial appointment made by Canada's first Prime Minister, Sir John A. Macdonald. Sources: "Anecdotes of Judge Morson," Law Society of Ontario Archives, 985180-001; Nancy S. Kastner, "The Notebooks of His Honour F.M. Morson," The Law Society of Upper Canada Gazette, xv, 4 (Dec. 1981): 399-442.